At Stella May Contracting we look for coachable individuals, who have a safety-first mindset, to join our work family. We are an equal employment opportunity employer who strives to maintain a diverse, inclusive and well-rounded workforce that will put us in the best position to perform well on the challenging projects that we undertake. Our vision is only possible if we can help you meet your career goals, and we strive to do this by investing in our employees. Some of the opportunities that are available to our employees are listed below. Please reach out to us if you want to learn more! Project management professionals are collectively responsible for delivering the project on time, under budget, and by the agreed-upon scope. The team includes the project manager, an assistant project manager, a project coordinator, field supervisors, equipment personnel, and our safety & quality control staff. The Pre-Construction & Estimating professionals are involved in the project pursuit phase. This team works in conjunction to respond to invitations to bid and solicitations by developing project estimates and qualitative responses to the requests. This team includes the estimators and the preconstruction manager. We self-perform earthwork and utility infrastructure. The on-site crew performing the work is the heart of these operations. 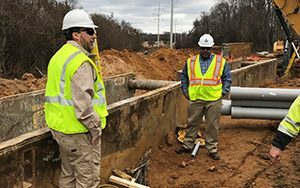 Depending on the project, the on-site crew includes a foreman, laborers, a heavy equipment operator, pipe layers (for water utilities), electrical duct bank crew members (electrical utilities), and a gas technician (gas utilities). Students and recent graduates who have completed or are currently pursuing a high school diploma, associate degree, or bachelor’s degree can apply for our internship programs. Interns gain work experience with a focus on project management, pre-construction & estimating, office administration, or field operations. Stella May Contracting treats each employee as a family member. 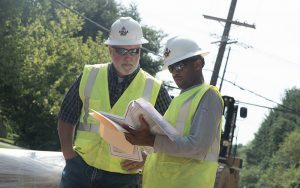 We promote the safety, well-being, advancement, and prosperity of our employees. We offer comprehensive healthcare, paid time off, and a 401(k) retirement plan. Stella May Contracting is an Equal Employment Opportunity (EEO) employer and does not discriminate on the basis of race, color, national origin, religion, gender, age, veteran status, political affiliation, sexual orientation, marital status or disability (in compliance with the Americans with Disabilities Act) with respect to employment opportunities.